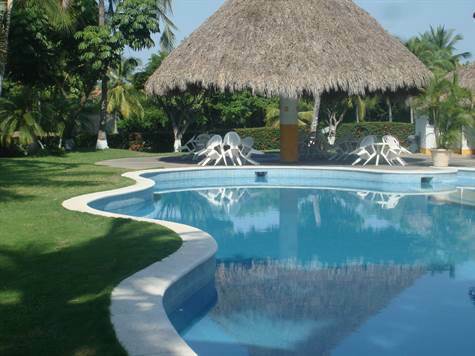 Marina Vallarta, Puerto Vallarta – A great opportunity to own villa/condo located right in front of the pool on Marina Vallarta’s famous Golf Course. The 2 story unit lends itself nicely for privacy and good use of space. Master bedroom with balcony and beautiful views to gardens and golf course. Living room with terrace facing the pool area and golf course the ideal location with the fantastic views. Underground parking included as well as storage unit for all your “stuff”. Property sold with all furnishings making this a simple way to go as its truly a turn key option. Just a few minute walk from the beaches & situated less than 5 minute walk from the Marina and all of its amenities restaurants, boardwalk, professional services, spas and so much more. Thursday Tiangies and Friday art walks will fill in for the complete experience.